Business members wishing to participate in the Greater East Aurora Chamber of Commerce’s Gift Certificate Program must fill out the Participation Agreement Form. The form can be filled out and submitted online – see form below – or it can be downloaded in pdf form, completed, and then either mailed to the Chamber offices at 652 Main St., East Aurora, NY 14052-1783; or faxed to us at (716) 652-8583. This program is designed to promote Chamber members and keep dollars in our community. Not a Chamber Member? Joining is easy – simply fill out our Membership Application. 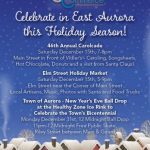 Certificates will only be available for purchase at the Greater East Aurora Chamber of Commerce offices. They will be sold in $5, $10 and $25 denominations and will be valid for six months from date of purchase. Certificates are redeemable only at PARTICIPATING Chamber members and cannot be redeemed for cash. To ensure authenticity, each certificate will be stamped with the Chamber’s embossed seal. Redeemed certificates should be submitted to the Chamber for reimbursement; the Chamber will issue checks at the end of each month. YES! The Gift Certificate Program is a great benefit, and I want to participate. Please include my business name on the list of participants that will be provided with each gift certificate. I have read, understand and agree to the above stipulations. If you wish to cancel this agreement at any time, it must be done so in writing and sent to the Chamber office.